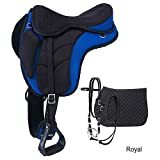 The endurance saddle is a close-contact saddle that is designed for long-distance endurance competitions, and for long-distance trail riding. 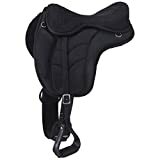 Endurance saddles are light weight and comfortable and typically have multiple rings which are used to carry supplies. Endurance saddles do not have horns, which is why they are also known as "English Endurance Saddles".